Your bed is the centerpiece of your bedroom, so it’s important that you pick out something that fits your style and will last a long time. We set out to find the best American made beds and frames for a variety of styles, doing research and testing from dozens of manufacturers – below are our findings. You’ll find tons of details about each of our top picks and the factors that went into our research. Be sure to check out our guide on the best mattresses made in the USA as well. During our research we looked through dozens of beds to pick out the few options most worth purchasing. We landed on a list of seven different beds, each with a unique style all its own. We were supremely impressed with brands like Montana Woodworks, Modernica, Skyline Furniture, Copeland, and several others. Choosing a favorite bed was very difficult, but we were able to make a list of our favorites by category. Take a look at them below and let us know if you have any questions! Below we explain why each of the beds made it on our list, and what you can expect when trying out any of these products. The Copeland Mansfield bed is the perfect solution for sleepers looking for a sleek and low-profile sleeping solution. This platform bed is constructed from beautiful hardwood cherry and is reinforced with hardwood interior blocks for maximum strength. It’s hand-assembled and built using durable bolt-through hardware for a secure hold. This bed is made from locally grown lumber and is built using green techniques for minimal emissions. Copeland Furniture is even recognized by the Sustainable Furnishing Council for its efforts to build environmentally friendly furniture! We love the solid feel of this bed thanks to its thick hardwood construction and the solid wide plywood slats used to support your mattress. The frame is so supportive that no box spring is necessary if you don’t want one, so you can achieve a very low profile and sleek appearance with this bed frame. It’s available in eight different colors and three sizes for good variety. Plush and sophisticated, this velvet tufted bed from Skyline Furniture is a piece that will stand out in any bedroom. We love the hand-crafted diamond tufts and the soft velvet upholstery that gives this bed a very upscale appearance. The bed is reasonably priced, and is built with a tough metal frame that should hold up well over time. It’s designed to be a standard height when installed, which means that you’ll need a box spring in order to lift your mattress up level with the bottom of the headboard of this product. This bed looks beautiful and it’s an excellent value for a buyer looking for that sophisticated appearance, making it a good investment. Timeless furniture like the Kincaid Cherry Park 5/0 panel bed are one of the best investments that you can make because they hold their value well. 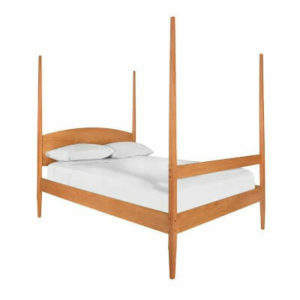 This is one of the best beds made in the USA because it’s durable, it’s beautiful and it’s supremely functional. The whole bed is built from solid cherry hardwood, so you know it’s going to hold up well over time. It has a beautiful look that will age well and that you’ll be proud to show off. We love the paneled construction of this simple-style bed, and the optional footboard storage system that gives you room for your valuables. The bed features a rock-solid center support system, and it’s something you can use for decades. 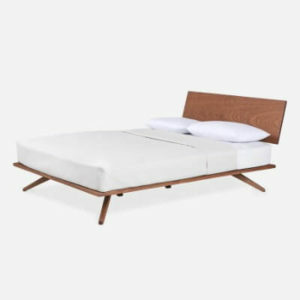 Create the ultimate minimalist aesthetic in your home with the light and airy Luna Bed from Modernica’s Case Study Furniture collection. The bed is sophisticated, rock solid, and built to last. This bed is crafted carefully from African mahogany hardwood and oiled for a beautiful look. It showcases the ultimate low-profile design and pairs nicely with a plush mattress. There’s no need to get a box spring with this product, and we love how supportive the bed is thanks to its tough slat support design. 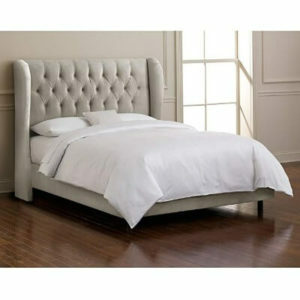 It’s lightweight and uses a thick metal support to attach the thin headboard to the bed to complete the look. If you want a bed that’s barely there, but that still adds some style to your space, this is the one. 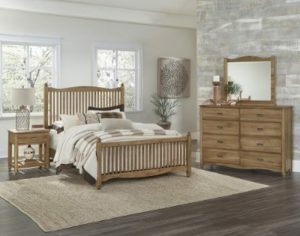 Bring a traditional look into your space with the Vaughan-Bassett American Maple bed collection. The beds in this furniture set are available in slat or shiplap designs, both of which have that sought-after traditional appearance. The beds are made from solid maple hardwood, and built with proven mortice and tenon joints for long-term reliability that’s hard to find in modern beds. The beds can be outfitted with two-drawer storage drawers that feature wood-on-wood glides for smooth performance. We love the look and function of these beds, and they’re available in a good mix of sizes for just the right fit for your space. The Vermont Wood Studios Shaker four poster bed is simple at first glance, but a bed that will impress you over time. This product is sturdy and formed entirely from hardwood. Select from Cherry or Maple included in the price, or pay extra to have a bed made from beautiful walnut. This tough bed is built with thick wood, solid bolts, and the natural wood is hand-finished with poly gel and linseed oil for impressive durability. We were impressed with the flexibility of this bed, along with its tough construction. Choose from six different sizes and add on additional options such as under-bed storage, a canopy, and a box-spring style frame for just the look you’re after. 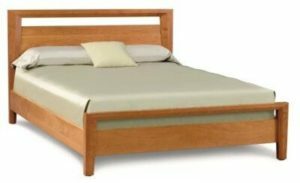 It’s a major investment to be sure, and additional modifications only raise the price further, but this hardwood bed is built to last a lifetime if cared for properly. Beautiful and rustic, it’s hard to overlook the charm of the Glacier Country platform bed by Montana Woodworks. 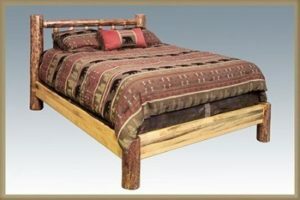 They have expert artisans handcraft each of the beds from solid pine logs. We love the natural look achieved by leaving the inner Cambium layer of the log intact while stripping the bark during construction. Each piece is locked together using a tough mortise and tenon joint. This platform-style bed requires no box spring and is triple lacquered for excellent moisture resistance over time. It’s a beautiful rustic creation, and a good value as long as you don’t mind the two to three week waiting period before it ships out. One of the most important factors we looked at when grading different beds was the materials used in their construction. We only wanted to select products that would last for many years through typical use. That’s why we focused on beds constructed from hardwoods (maple, walnut, or something else sturdy) or metals. While reviewing each product we also looked closely at the thickness of the materials used and their overall quality. After verifying the materials used to construct the beds, we looked at how each bed was actually constructed. Quality materials are only reliable when used to their full potential. We looked for strong joints, good hardware selection, resilient joint construction, and proper material treatment when selecting beds. Any hardwoods should be treated against moisture and designed to withstand sunlight over time. We only selected beds that were clearly built to expert standards. Different people have different size requirements and we understand that. That’s why each bed we selected offers a range of size options to choose from. We avoided beds offered in a single size, because they’re far too limiting. Most have at least three options, and others have as many as six size options, making it easy to get the perfect sized bed for your bedroom. Finally, after verifying the quality and the size options of different beds, we looked at the extras being offered. This includes things like different color options, added storage solutions, platform or box spring options, an add-on canopy, and much more. All these extras help to give you the customized solution you want. At last we considered the price of each product. We didn’t rule out expensive beds, but instead verified that each asking price is reasonable for what is being offered. Metal-frame beds are more affordable than hardwood beds are, but that doesn’t mean the hardwood beds are unreasonably expensive. We skipped over beds priced far too high for what they offer – we want to make sure you’re getting the best bed frame and headboard for your money!